After much thought, discussion and prayer over a long period of time, on the eve the Feast of the Presentation of the Lord in the Temple on 2nd February, we celebrated a new chapter in our long history when we welcomed four long term guests to our community. This new venture has been discerned by our Chapter in response to an expressed desire by a number of our Oblates and friends to seek God more deeply in their lives by following the Rule of St Benedict in a monastic setting. 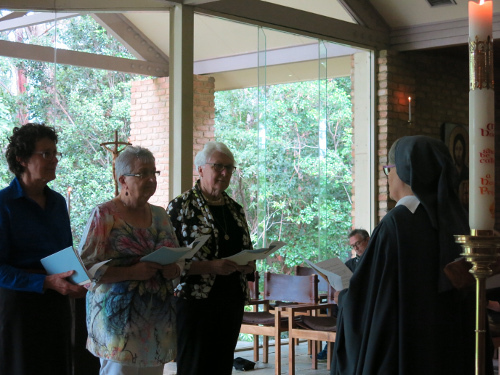 The four women we welcomed and blessed at the beginning of Vespers that evening are Pat, Felicity, Patricia and Jemma. Some have come for a period of three months and others have committed to longer stays. During their time with us, they live in one of the Cottages in our Retreat Centre and join us in choir for the Liturgy of the Hours and the Eucharist, as well as being assigned to a work area during the day. 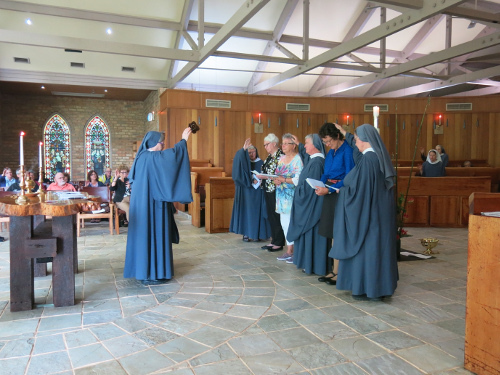 They also receive formation on the Rule of St Benedict and Monastic Practices, have a spiritual director and participate in the Cottage Retreat Days. The hope of this venture is that these long term guests will be richly blessed during their time with us and return to their families, communities and workplaces renewed and refreshed to continue to bring forth the Kingdom of God. We ask you to join us in praying for these four brave women and praying for us as we endeavour to respond to our God and the needs of the times. 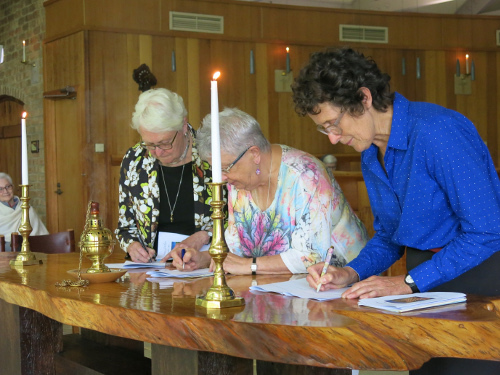 “Pat, Felicity, Patricia and Jemma, we pray that you will be blessed with a listening heart, attentive to the voice of the Lord calling to you in the Liturgy of the Hours, in Lectio Divina, in your work and in the events of every day. May you be blessed with a spirit of discipleship in this school of the Lord’s service. May you be blessed with a spirit of patience when called to share in the sufferings of Christ. May you be blessed with an open heart as you embrace the many charisms of the Benedictine life. Following this, the community and all present stretched forth their hands over the women as we sang our traditional Blessing Song for them. They were then invited to take their places in the choir of the Abbey of the Presentation of the Lord in the Temple… such a perfect feast day to celebrate this new green shoot of life in our community’s history!